"Meet a man who never met a woman he didn't love." 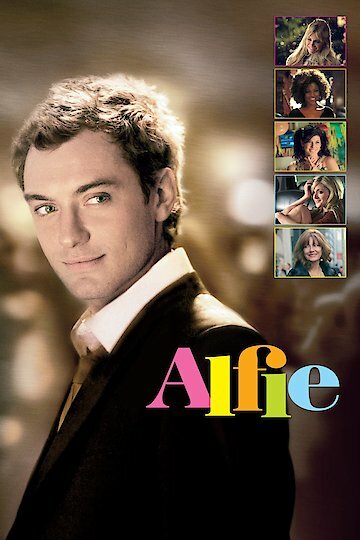 Alfie is about a charismatic British man who has taken up residence in New York City. Alfie is all about style and having good taste, as he continually tries to improve his standing with the women he meets at local bars. To make money, Alfie works as an anonymous limo driver. At night, he comes alive and turns into a suave, sophisticated man of the world. In fact, settling down with a woman is the furthest thing from Alfie's mind. He has several romantic partners, including a single mother named Julie and an unhappy married woman named Dorie. Alfie treats all of these women as if they were simply objects that are expendable. Meanwhile, Alfie's best friend, named Marlon, is working hard to maintain a relationship with one woman, his ex-girlfriend Lonette. Marlon still has feelings for Lonette but is somewhat scared of total commitment. He sees the fun lifestyle that Alfie has but knows that that is not necessarily for him. However, due to Marlon's hesitation, Lonette continues to ignore his attempts at reconciliation. Alfie decides to jump into the situation and help Marlon. In the process of trying to convince Lonette to take Marlon back, Alfie winds up seducing the woman. Alfie is ashamed of his behavior and does not want to even face Marlon. The situation becomes worse when Lonette finds out she is pregnant with Alfie's child. Alfie pays for an abortion, but Lonette reconciles with Marlon, and the two leave New York without saying anything to Alfie. Alfie's on-again, off-again girlfriend Julie finds out about some of Alfie's more promiscuous activities and totally breaks off communication with him. Alfie is feeling low after the situation with Lonette, but he can not find solace in the arms of the woman he thinks he could love. In the end, Alfie discovers that his self-indulgent lifestyle has left him lonely, lost and completely unsure about his future. Alfie is currently available to watch and stream, download, buy, rent on demand at Amazon Prime, FlixFling VOD, Amazon, Vudu, Google Play, FandangoNow, iTunes, YouTube VOD online.